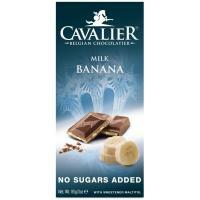 Banana Milk chocolate with Maltitol instead of added sugar. Cocoa solids: min. 37 percent. 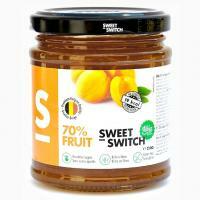 Apricot spread, sweetened with stevia extract (and containing a small portion of fruit sugar). Has only 99 calories per 100 grammes. 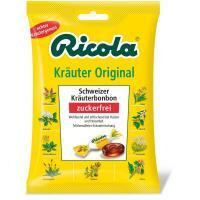 Can be used to spread on bread, to make jam cakes or to fill croissants, to enrich white yoghurt, and so on. Note: Contains a portion of sugar by nature. The product has a gross weight of about 368 grammes. A small "Sweet-Switch" chocolate bar, type Milk, with stevia instead of sugar. Cocoa solids: min. 36%. A "Sweet-Switch" chocolate bar, type Milk - Salted Caramel, with stevia instead of sugar. Cocoa solids: min. 34 percent. A small "Sweet-Switch" chocolate bar, type Dark, with stevia instead of sugar. Cocoa solids: min. 70%. Tropical jam, sweetened with stevia extract, isomalt and sucralose. Has only 79 calories per 100 grammes. Fruits: 55% (peach 34,8%, mango 12,7% , pineapple concentrate 7,5%).